, whom L‘Avocat prqnounces one of the most judicious and accurate critics and historians that France has produced, was born at Paris Nov. 30, 1637. His father, John L,e Nain, was master of the requests. About the age of ten, he was sent to the famous seminary of the Port Royal, where his attention to instruction, and his proficiency, were very extraordinary, and where he very early became fond of ’the study of history. This partiality seems to have been first excited by a perusal of Baronius, and while thus employed he was perpetually putting questions to his master | Nicole, who at first gave him such answers as came in his head at the moment, hut soon found that his pupil was not so easily satisfied; and Nicole, although by no means ignorHiit of history, used to dread his approach, lest he might ask questions for which he was not fully prepared. At the age of e ghteen Tillemont began to read the fathers, the lives of the apostles, and their successors in the primitive church, and drew up for himself an account of early ecclesia^tical history, in the manner of Usher’s Annals, a hook he much admired, and formed his pwn somewhat on the same plan. In the mean time he was successfully instructed in other branches but it was a considerable time before he made choice of a profession. In this he was at last influenced by M. Choart de Buzanval, bishop of Brauvais, who determined him in favour of the church, and gave him the tonsure. About 1663, he went to reside with M. Hermant, a canon of the cathedral of Beauvais, and remained there five or six years. He then returned to Paris, and lodged with M. Thomas de Fosse, an old school-fellow, for about two years; but although in all these situations he was constantly employed in study, and had the quiet enjoyment of his time, he removed to the country, and, after receiving the other orders of his church, and being ordained priest in 1676, he settled at Tillemont, whence he took his name, about a league from Paris. About this time he was employed, along with his friend M. de Sacy, on a life of St. Louis, and two years after he travelled in Flanders and Holland. After his return, he continued his studies, and, in 1690, began to publish his <k History of the Emperors,“which was very favourabl\ received, and made the public more anxious to see his history of the church, on which it was well known he had been for some time employed. 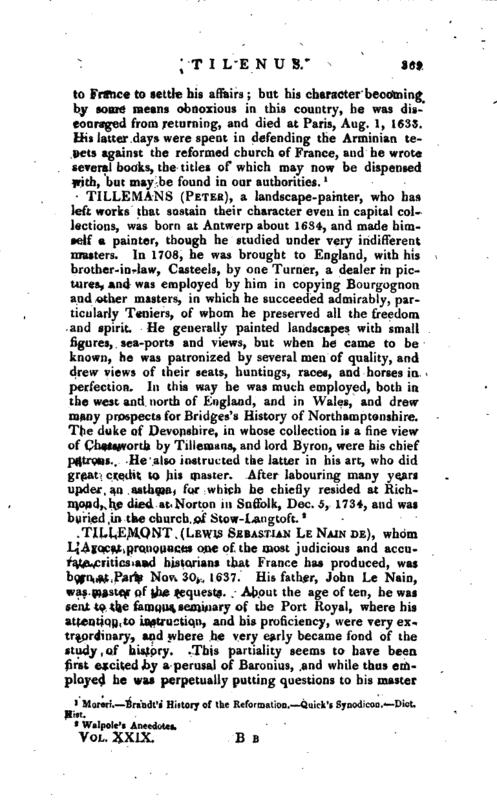 His” History of the Emperors“was, in fact, a part of his ecclesiastical history; hut when he printed a volume, as a specimen, it fell into the hands of a licenser of the press, who made so many petty objections, that M. Tillemont determined to suppress the work rather than submit to the proposed alterations and omissions, as none of the objections were in any way contrary to the received doctrines of the church. He then, by the advice of his friends, published the history of the emperors separately; and there being no occasion in this case for a theological licenser, he published vol. I. in 1690, 4to; and completed the work in five vols, | in 1701, which had abundant success; was reprinted at Brussels, and translated into English. This was followed by his ecclesiastical history,” Memoires pour servir a l’Histoire ecclesiastique des six premiers siecles," &c. 1693, &c. completed in sixteen volumes, quarto. Extreme accuracy of facts and dates constitute the great merit of this work, and the want of a more methodical arrangement, and of a better style, its chief objections. Dupin wishes he had reduced his work to the form of annals, in imitation of Baronius; and this opinion having been conveyed to M. Tillemont, he said he could not think of going over the materials anew, but was very willing to give his manuscripts to any person who would take the trouble to put them in the form of annals. No such person offering his services, M. Tillemont proceeded in his own way, in which he met afterwards with very little opposition, except a short controversy, of no great importance, with father Lamy. Tillemont was intimate with M. Hermant, doctor of the Sorbonne, Baillet, Nicole, and many other learned men, who frequently consulted him. To a complete knowledge of ecclesiastical history, he joined an exemplary humility, and regularity of conduct. His humility, indeed, was so great, that Bossuet, seeing one of his letters to father Lamy, besought him, *‘ not to be always upon his knees before his adversary, but raise himself now and then up." 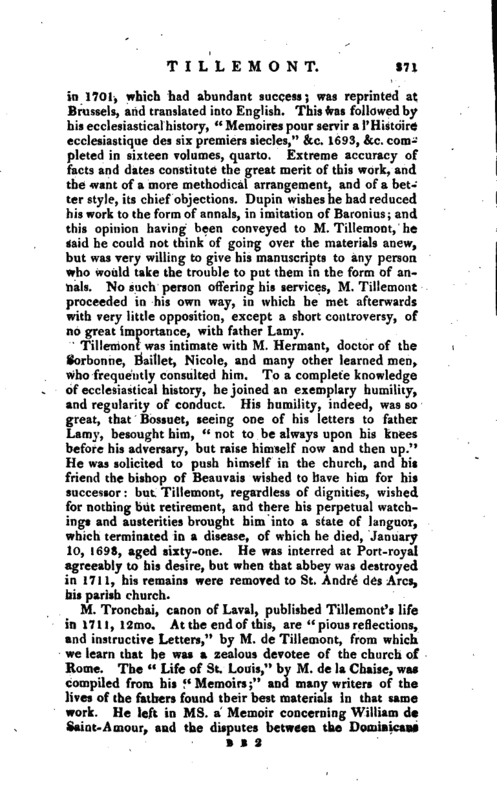 He was solicited to push himself in the church, and his friend the bishop of Beauvais wished to have him for his successor: but Tillemont, regardless of dignities, wished for nothing but retirement, and there his perpetual watchings and austerities brought him into a state of languor, which terminated in a disease, of which he died, January 10, 1698, aged sixty-one. He was interred at Port-royal agreeably to his desire, but when that abbey was destroyed in 1711, his remains were removed to St, Andre des Arcs, his parish church. 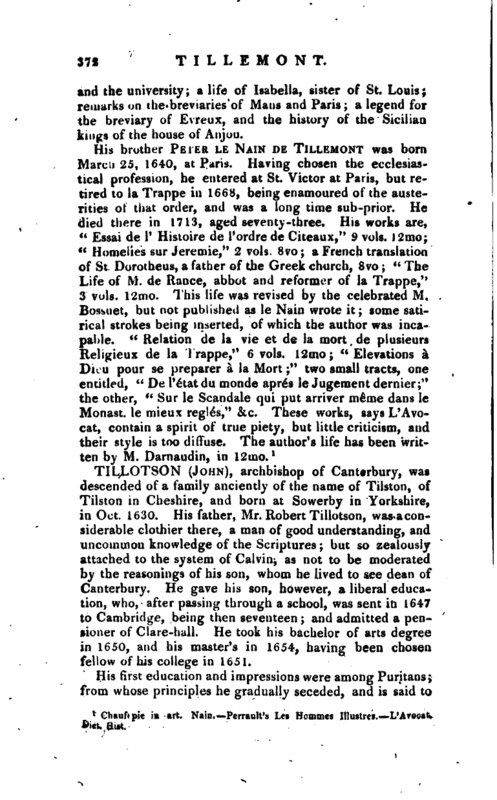 M. Tronchai, canon of Laval, published Tillemont’ s life in 1711, 12mo. At the end of this, are “pious reflections, and instructive Letters,” by M. de Tillemont, from which we learn that he was a zealous devotee of the church of Rome. 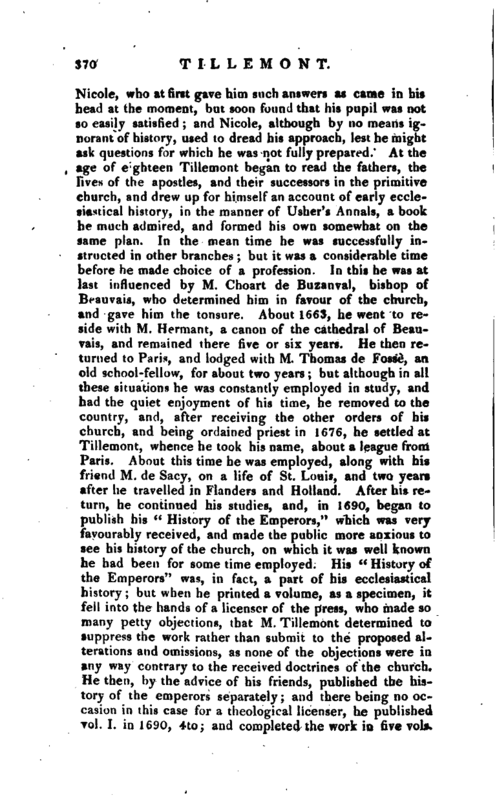 The “Life of St. Louis,” by M. de la Chaise, was compiled from his “Memoirs;” and many writers of the lives of the fathers found their best materials in that same work. He left in ms. a Memoir concerning William de Saint- Amour, and the disputes between the Dominicans | and the university; a, life of Isabella, sister of St. Louis; remarks on the breviaries of Mans and Paris; a legend for the breviary of Evreux, and the history of the Sicilian kings of the house of Anjou. 1 Chauftpie in art. Nain. Perrault’s Les Horames Illustres L’Avocat - Hist.